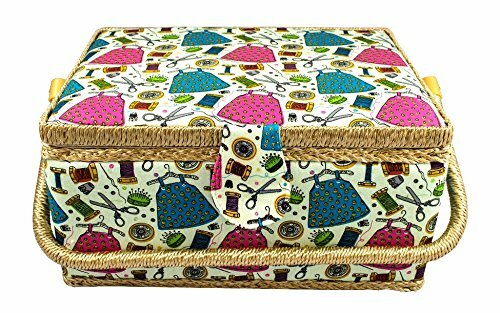 Very cute, but sturdy fabric covered sewing basket, large 12 1/2" x 9" x 6 3/4", includes a basic but handy sewing notion kit and a handy insert tray to organize your most needed items. Will bring years of enjoyment and makes a great gift for your crafter. You are very important to us as a customer, please remember to ask and reach out if you have anything that needs attention before leaving any negative feedback. Please give us the opportunity to help correct any situation that may come up. Large 12 1/2" x 9" x 6 3/4"
View More In Storage & Furniture. If you have any questions about this product by Tidy Crafts, contact us by completing and submitting the form below. If you are looking for a specif part number, please include it with your message. Basting Tape, Double Faced, 3/8" X 60 Yard Roll - Fast Shipping from The USA!